But at least i got one thing done, that is the beauty and pampering section making sure i have sufficient supply of useful products for a quick pampering fix since it's gonna be a month long of recovery (hopefully shorter) and time is definitely of an essence when lil parasite is gonna be needing attention 24/7. Gotta say goodbye to facials, monthly salon visits, random window shopping but at least those are the things i can do from home as well with the help of simple ready packed beauty products (for facial & hair) and technology (shopping). Waterproof make is something all girls NEED in their life, whether its gonna be for vacation purposes, watching a sob story movie or preparing for a break up, so keeping those eyes panda free is definitely necessary at this point. So today's blogpost and mini experiment features Miss Hana's new arrivals, to fit the these 3 criteria of being long lasting, waterproof and compact. 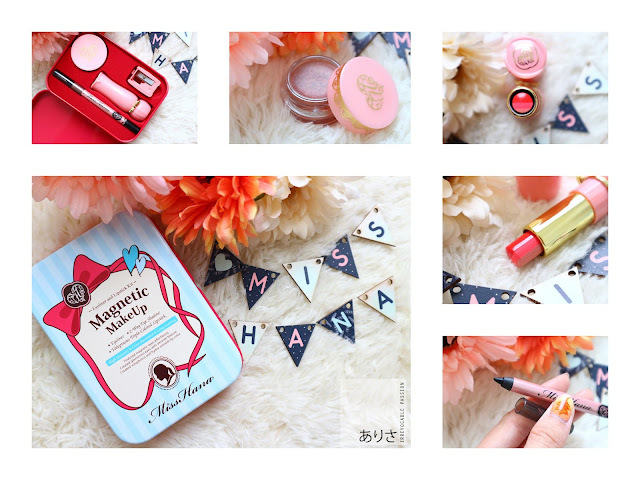 My journey with Miss Hana and Hanaka brand has been a fruitful one so far, as most of the products end up in my highly recommended as they have proven themselves to be an affordable, effective and user friendly especially for all the newbies out there who are looking to explore beauty brands that would suit their needs and budget range. My hand wrinkles are gone in a sec and instantly brighter! Primers, the first step to making sure your make up stays put the whole day without patching up or melting off our face. Though many foundations/ BB/ CC cream or even cushions these days to have claimed that their products comes with primer infused already but i am somehow not too convinced about that part so i usually try to make it a habit to put my own layer of primer before putting on the foundation. It's exactly like how they say when their products already contains moisturizer and SPF so you can skip those steps by just directly using their products, i mean..yes they may contain those but the amount isn't sufficient for the entire skin so it's always best to not compromised on your skincare regime or make up base. Though it gives a slight oil-ish finishing at first after applying and evenly spreading out but it mattifies in a couple of minutes. But the million dollar question is whether it's effective or not, i can say yes it does make your foundation last extra longer (worn mine from morning to evening) as i did not experience any patchiness nor unusual excess oil secretion except for my usual T-zone area that needs occasional blotting. But do take note if you have really serious scars/ pore holes that needs filling, this primer doesn't really cover that part completely as you will need a more denser primer textures to smoothen that out. EYEBROWS! Because who doesn't love them? The one thing that determines a person's entire features are their eyebrows. I am not kidding about that either, because one can instantly notice that something is amiss on a stranger's face if he/she is missing their eyebrows lol, it just feels "empty". I know i am not blessed with thick eyebrows to begin with but that doesn't stop me from trying to create that illusion but playing around with various eyebrow color tools like pencils, powder, cream, temporary tattoos and even gels! There's just so many to choose from these days but all of them are created to serve a different outcome, so just because it's labeled- "for eyebrow usage" that doesn't mean the result from the application would be similar to other eyebrow products you have used before this lol. 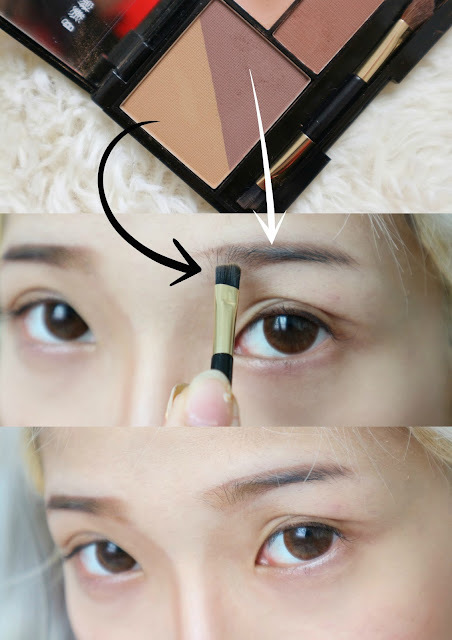 For the price and size, this palette can easily last for more than 4 months with daily usage and it has 4 shades that serve different purposes. Can be use to not only give your eyebrows a more defined and fuller look, it can also be used to contour your nose and used as eyeshadow! Multipurpose, compact that comes with a mirror and duo headed brush (one side flat, the other is angled). Not many people know how to draw their eyebrows, my tip to filling them in is to use the darker shade to draw the outline arch and the lighter colored one to fill them in, starting from the middle of your brow moving to the inner corners. This eyebrow powder is water/ sweat proof and it did not fade away after a whole day of usage which is good so less touching up required! For Miss Hana's 2nd edition Magnetic Make up kit that features all their best sellers and customer favorites like their cream eyeshadow, 3 tone lipstick and pencil eyeliner + sharpener, makes it an easy GRAB and GO product that comes in a pretty designed tin securing your products from any damages that might occur while on the road. Usually travel kits tends to be in miniatures but rest assured that the products you are getting in this tin are FULL SIZED. In this kit, it's said on their site that the products are waterproof so that's how i got the idea of putting it into this month's beauty discoveries and so far the results from this experiment has been proven fruitful. I avoided any contact the lipstick of course as the texture isn't matte (more to moist) so that will obviously wipe off first but emphasized more on the cream eyeshadow and eyeliner. 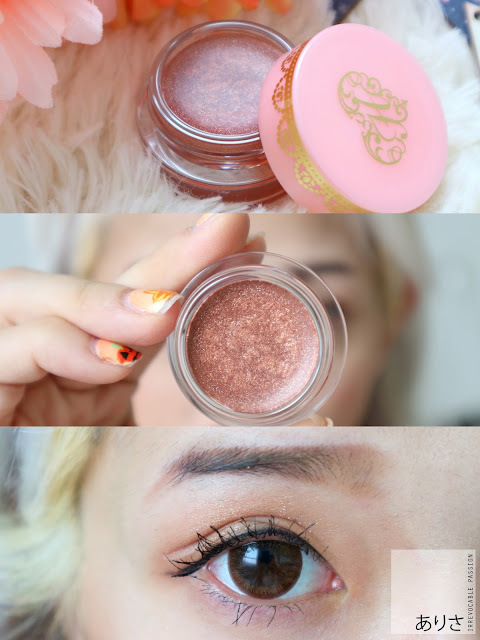 Gotta admit that this is the most prettiest eyeshadow shade i have ever seen, it's basically rose gold and this color practically suits almost every skin tone as it's considered one of the neutral shades used to brighten up your eyes. You can get other colors from Miss Hana's site and customized your very own kit to fit your mood since the sizes are standard! Would be great if they have a liquid eyeliner option so they don't need to put in the sharperner giving it more space for a mascara as well. I noticed many of my friends gave the excuse of being make up-less during their travels because first of all they are lazy (that mindset, i can't help la) and bringing their usual large bag of cosmetic product along takes up too much space in their luggage but that did not stop them from complaining "wish i brought/ wore my make up" when it came to photo taking sessions lol. Girls, very typical of us to complain instead of finding a solution to our problems first so that's why you have my blog! 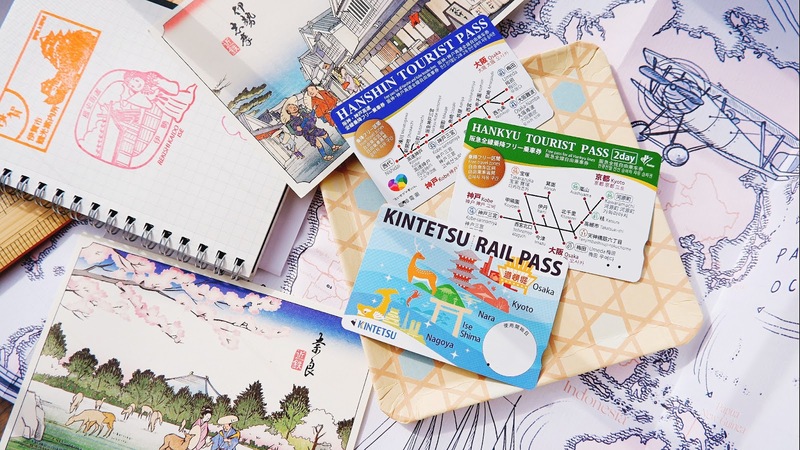 So now that i have reviewed this product for you, please go get it and stop giving 101 complaints and excuses while you look dreadful in travel photos lol. Being a sucker for anything that makes my life convenient, you will constantly see me searching high and low for things that can save my time/ effort yet produce they same amount of results. This magnetic kit is no difference, if i can look photo ready just using these few products anytime and anywhere without having to bring my entire make up collection with me, pretty sure that counts as a success already. Initially i thought that i could use this for my waterproof experiment but unfortunately it's not waterproof, this mascara removes easily with warm water, so if i am gonna be tearing like mad during labor think this mascara would be the first to melt off while the rest of my make up stays intact lol. 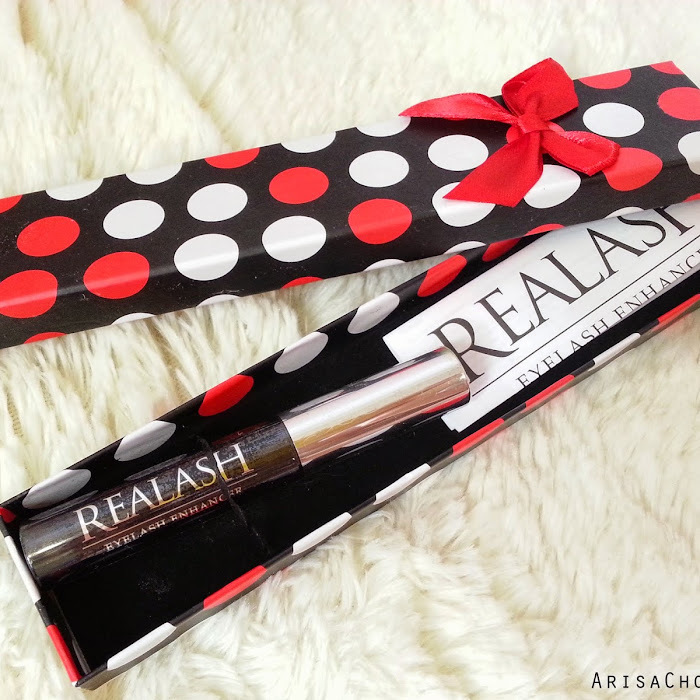 It's a great mascara for lazy days as you don't need special eye make up remover for this. In terms of performance, it does provide your lashes with ample volume without clumping even after 5 applications. 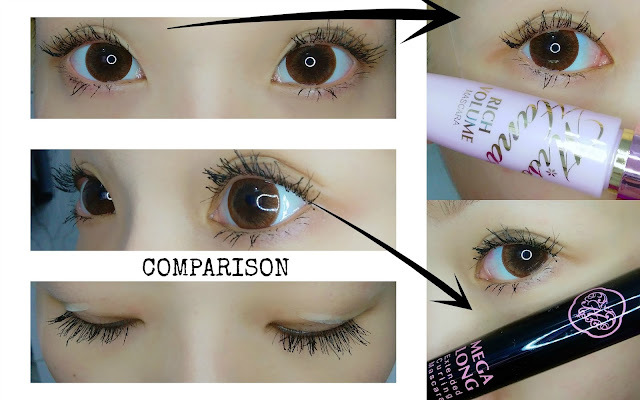 Did a comparison between the Miss Hana Mega Long Mascara and Rich Volume mascara, both are easily removed by warm water and their names are pretty self explanatory lol. Depending on what you are looking for in a mascara, hope this photo helps! Now that i am done with my quick waterproof make up experiment, let's move on to the Home Pampering Remedies. Having these Hanaka beauty essentials at home, i can have my own pampering session without stepping out of the house, how convenient of them to create mini packets like these lol, if you are planning for travels it can also be brought along without taking too much space too since it is packed in sheet packs. Speaking of packing for my hospital bag earlier, my biggest distress if carrying liquid stuff in my bag despite sealing it in a ziplock bag prior to putting it into my toiletry bag, so i am indeed amazed to find facewash that comes in POWDER sachet form! Each packet is enough for 1-2 washes, for me at least ad i don't use that much. 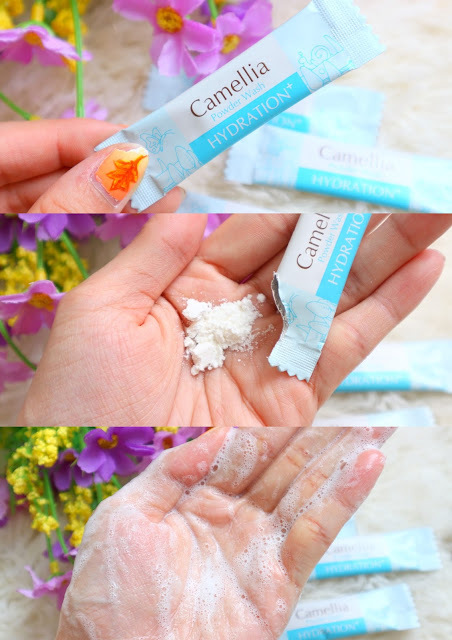 So a small packet can last me for morning and night face cleanse, it's foamy just how i like it with a very calming floral scent (camellia flowers) leaving my face feeling super refreshed, i can now bring a couple of this inside my hospital bag without having to worry about any leakage or cramp space issues! Hanaka Eye Patch Resiliency+ Fish Shape ( click to purchase), can foresee this product being something that i would use daily after lil parasite arrives to combat my wrinkles and dark circles lol. 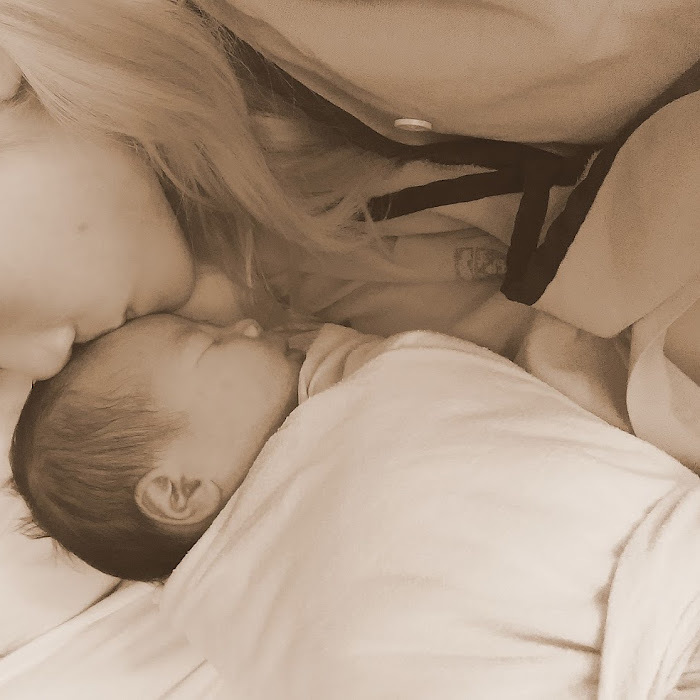 It's seriously not a joke when they say babies needs a minimal of 8 feedings per day and night so i gotta be on standby during late nights as well. Can bid my sleep goodbye already, well at least my panda circles wouldn't be as bad with these products in hand! Usually i would head to Daisuke Salon to get my hair pampering session done but due to time constraints and i am in need of a QUICK fix, Hanaka Hair Warm Hair Pack - Argan Oil & Shea Butter (click to purchase) would do a great job settling that problem. Over the weekend, i had a couple of events to attend but prior to that i had not wash my hair up to a week and as a result it became quite messy and unruly, lesson learnt that no matter how busy i am, i have to wash my hair at least 2 times a week instead of just tying up my hair lol. 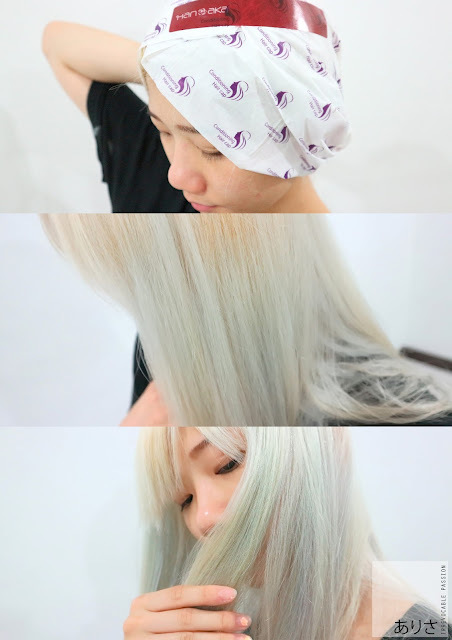 My tiredness is no joke, i am one of those people who would rather walk into a salon to get people to do for me a deep scalp cleanse rather than washing my own hair lol but driving to the salon and sitting there does consume alot of time as well. 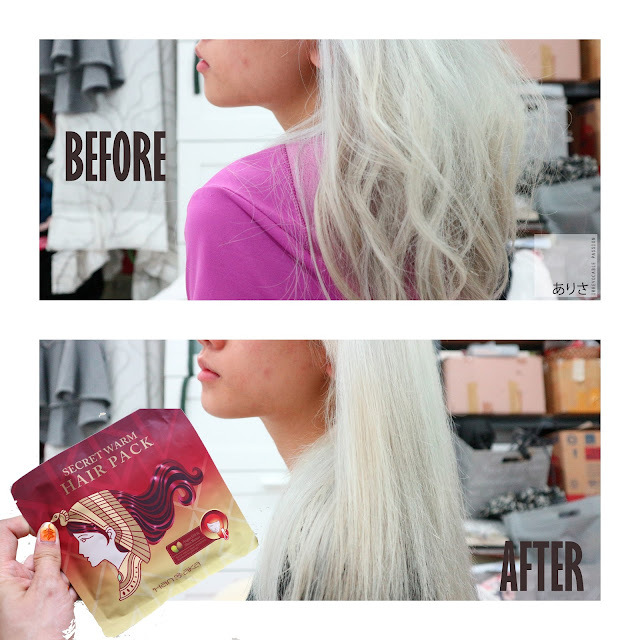 So with a home hair mask pack like this, i can just use it while doing my blogging or catching up on my iflix marathon. The warmth feeling isn't much in my opinion, that probably varies from scalp sensitivity but your hair would definitely be super smooth for the next few days! I have seriously no idea why does my feet always have tons of dried harden cracked skin all over, doctors says the only thing i can do is keep them constantly moisturized but i don't like putting cream on my feet as the whole house will feel oily afterwards and there's also a risk of slipping and falling from it. So my alternate solution to achieve smooth feet is having it being "reborn"again, just like newborns who have such smooth and soft skin lol. Foot masks is quite a common product in Japan as i always get a few during my travels, they are also available in Malaysia but it's usually double the price which is rather insane, might as well use that money to go for fish spa session except i can't stand the ticklish feeling lol. But Hanaka understands the demand of effective foot masks like these thus creating their very own affordable version! 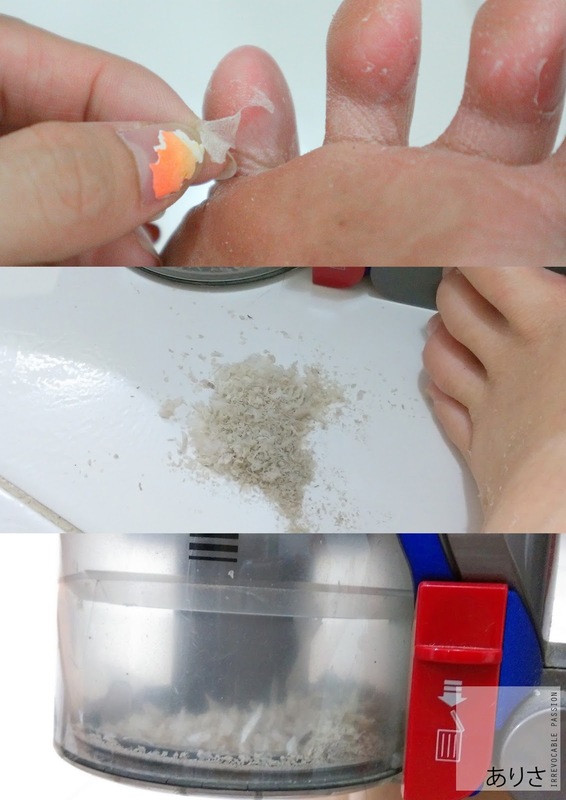 After giving Hanaka Royal Jelly+B12 Callus Removal Foot Pack a try, think my restocking problems have been settled, as i am typing this post i am shedding my DNA all over the place lol there's just so much dry dead skin flaking away. Upon wearing the foot mask for at least 60 mins, it is recommended to soak your feet for 10-15 mins afterwards to soften your skin further and remove any excess mask residues and one would ask "how long till the flaking starts?" Thank you guys for reading my reviews and as usual i hope all my postings on Miss Hana & Hanaka brand has given you a better insight of it and aiding you on your comparison/ purchase quest! You can get the items on the clickable links above or you can directly visit www.beautystall.com. Big thank you to the amazing Beautystall team who are always attending to my inquiries on the products so that i may share it with the rest of my readers. Always heard of this brand but I wasnt sure of its outcome. Now that I'm convinced after reading your post. And btw, I love the eyeshadow shade! Love your detailed review that came with awesome photos! Thanks for sharing, never actually heard of this brand before, wow the leg pealing looked painful. What caught my attention is the hair mask, might give it a try. I love the way you edit the photos!! so fun! Thanks for sharing such great reviews once again. I think I'm gonna get the foot mask. Been using Actizen and it costs almost RM50 a packet. Wow~ I would love to give them a try! seriously everything is so good!! 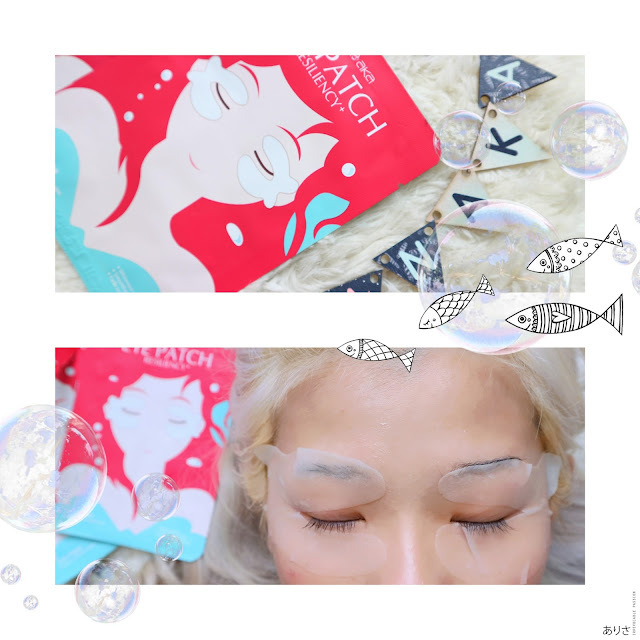 The eyeliner set is so convenient and travel friendly =D Even the foot mask is so effective!! hehe, "i'm confinement ready" eh? Happy experimenting with various make up shades when stuck at home during confinement! :D:D.. it should be fun.. i guess. Love your comprehensive reviews! looks like a very good and handy product to go with! Wow Arisa, I love your detail reviews. Well done. I need to go grab some Hanaka Eye Patch Resiliency+ Fish Shape for my panda and haggard eyes. I almost wanted to get the primer but I didn't know if anyone reviewed it before. The promotion video looks so promising. Now, I'm thinking twice.